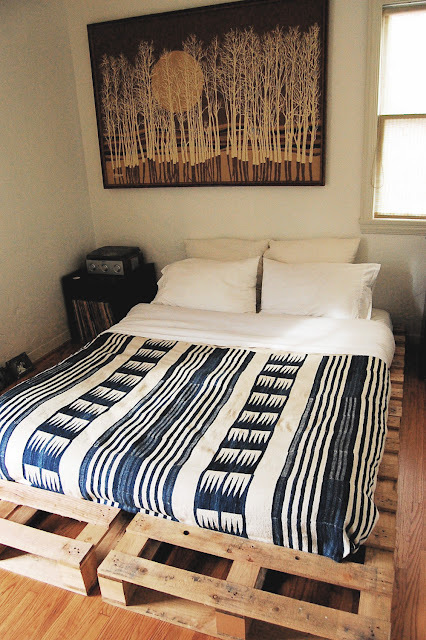 My friend Helen recently moved into a new place and was on the hunt for a simple, low profile bed frame. When the usual places didn't have what she was looking for she opted for this DIY platform bed made of shipping pallets. The perfect boho bedroom for a Venice surfer girl if you ask me. Bt-dubs love the coverlet. Check out Helen's blog here. Beautiful! That is a great idea! i love this idea... where can you find pallets like that?